Untoward effects encountered after a procedure are divided into side effects and complications. Side effects are defined as common undesired consequences of the procedure, which rarely result in substantial morbidity (26). Complications are further subdivided into major and minor complications. Major complications are those that might threaten the patient's life if left untreated, lead to significant morbidity or mortality, or result in a significant change in the course of hospitalization. All other complications are considered minor (26). Postablation pain is the most commonly encountered side effect. Simply placing the applicator can result in significant soft tissue trauma, particularly because multiple passes are frequently performed through essentially the same tract. With the heat-based ablation modalities, the thermal damage to the renal capsule, abdominal wall, and diaphragm can result in tremendous postablation pain. In the immediate postablation period, patient-controlled analgesia or oral narcotic analgesics may be necessary. Cryoablation is relatively well tolerated with less significant discomfort after the ablation. Infusion of 5% dextrose in water into the peritoneal cavity between the liver and diaphragm is being used at the UW CSC to insulate the diaphragm during RF ablation of hepatic tumors located adjacent to the diaphragm. The technique has resulted in a significant decrease in postablation pain for these patients. The role for this and similar techniques in renal ablations has yet to be evaluated. Postablation syndrome is a frequently encountered side effect, described as fever, malaise, and body aches encountered in the immediate postablation period (93). This syndrome has been well documented for liver ablation, but it is unclear how severe this problem is after renal tumor ablation. However, it is anticipated that renal ablation will provoke a similar response based on the volume of ablation. For the liver, the severity of the syndrome appears related to the volume of tissue ablated. The symptoms respond well to anti-inflammatory therapy, implying that the syndrome is related to the inflammation that develops around the necrotic tissues (93). At UW CSC, anti-inflammatory medications are given prior to ablation and 48 hours postablation to decrease the severity of both the postablation pain and the postablation syndrome. Complications are relatively infrequent after percutaneous renal tumor ablation (15-18). Hemorrhage is usually reported as a minor complication, but could also be considered a side effect because it is almost always self-limited and rarely results in significant morbidity. The coagulation associated with heat-based ablation limits postprocedure bleeding. Cryoablation does not have this effect and theoretically, should have a higher rate of hemorrhage. However, significant hemorrhage has been very infrequent with either ablation modality in the clinical setting (75). Skin burns at ground pad sites are another relatively common minor complication seen most frequently early in the experience with RF ablation. However, the rate of skin burns has been substantially reduced as the proper number and appropriate positioning of ground pads have been established for the various generators and devices. Major complications occur in less than 2% of reported image-guided renal tumor RF ablations, and there have been no reported deaths (15-18). Nephron-sparing surgery on the other hand is associated with a major complication 14% of the time, and has a 1% to 2% mortality rate (7). One of the more common complications encountered with RF ablation thus far is injury to the lumbar plexus, which is associated with a postprocedure syndrome consisting of pain, paresthesia, and numbness in the flank and groin (16,56). The lumbar plexus is located along the anterior aspect of the psoas muscle and is most susceptible to injury when a posteriorly positioned tumor is being ablated. Thus far, these symptoms have been self-limited and usually resolve within one to two months (16,56). Another significant complication that has been reported after RF ablation of centrally and inferiorly located tumors is thermal injury to the ureter (15). Ureteral injuries are concerning because they can lead to stricturing and resulting urinary tract obstruction that threatens the function of the kidney. The placement of a uret-eral stent prior to the ablation is being evaluated experimentally and theoretically may decrease the likelihood of ureteral stricturing for two reasons. When left in place, the stent may mechanically prevent stricturing, even if the urothelium is injured. Also, the stent provides the opportunity to lavage the renal collecting system with cold fluid during heat-based ablations and with warm fluid during cryoabla-tions. This lavage fluid might protect the ureter from achieving temperatures necessary for significant damage to the urothelium. Water, dextrose, or saline can be used as lavage fluid for many types of ablations; however, saline should not be used for lavage during RF ablation. As previously mentioned, saline is an electrical conductor and in this instance its use might actually promote/exacerbate ureteral injury. To date, no definitive data are available to indicate whether the use of ureteral stents and lavage is clinically efficacious. Figure 8 RF ablation of a locally recurrent anterior RCC. (A) After an unsuccessful percutaneous ablation, this patient underwent partial nephrectomy. 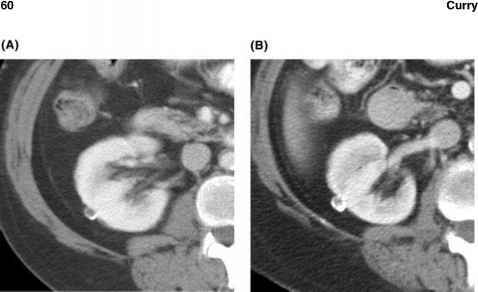 A follow-up CT scan identified a local recurrence (arrow) in the renal bed, closely adjacent to the descending colon (open arrow). Because inadvertent damage to the colon can result in significant morbidity, this tumor would usually be approached laparoscopically. Infusion of sterile water or D5W into the perirenal space can be used to insulate and displace the colon. 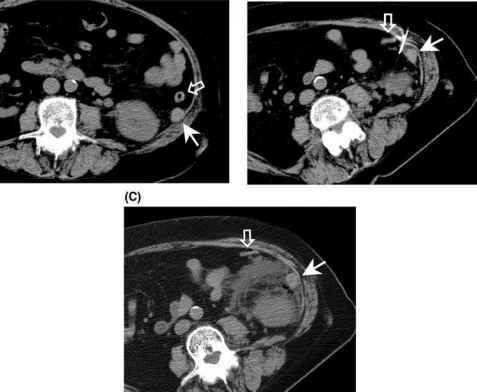 (B) In this case, a needle was placed between the mass (arrow) and the descending colon (open arrow) under CT guidance. (C) D5W was infused through the needle, displacing the colon anteriorly (open arrow). This allowed the recurrent mass (arrow) to be safely ablated percutaneously. Abbreviations: RF, radio-frequency; RCC, renal cell carcinoma; CT, computed tomography; D5W, 5% dextrose in water. Most anterior renal tumors have been ablated intraoperatively due to the risk of injuring the adjacent colon. A developing technique for RF or DSW is the infusion of sterile water into the perirenal space between the kidney and the colon (Fig. 8). Theoretically, the fluid protects the colon from injury both by separating the colon from the kidney spatially, but also by acting as an insulating agent, because it is non-conductive. Early results using this technique are very promising (24). Infusing fluid to protect adjacent structures may also be helpful for preventing ureteral and lumbar plexus injuries. Because water might not provide similar protection for cryoablation, esophageal dilator balloons are placed in the anterior perirenal space to act as a spacer prior to cryoablation of anterior renal tumors (75). The full potential of these techniques has not yet been realized, but as they become better studied, and are refined, their use may allow the indications for percutaneous tumor ablation to expand further.